GSK has entered the ‘smart drug’ industry by partnering with a health technology company to develop a sensor for use in clinical studies of its Ellipta inhaler. The sensor, designed by US firm Propeller Health, will record patients’ use of the inhaler, and wirelessly transmit the data to a central repository. It will be used in studies of patients with asthma and chronic obstructive pulmonary disease (COPD). 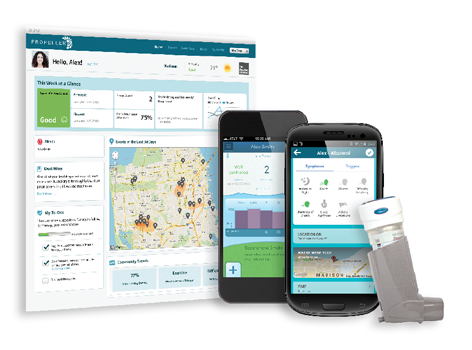 Propeller Health is the provider of an FDA-approved digital health solution for improving outcomes in asthma and COPD. The technology has regulatory clearance for use to measure and improve medication adherence, help predict exacerbations, and help reduce the frequency of symptoms and exacerbations in asthma and COPD – all common outcomes measured in asthma and COPD trials. This week the Wisconsin-based firm signed a development agreement and R&D collaboration with GSK for its Ellipta inhaler. Under the terms of the non-exclusive agreement – the first between the two companies – Propeller Health will develop and manufacture a custom sensor for the Ellipta inhaler for use in certain GSK clinical studies in asthma and COPD. The sensor will automatically collect and record data on the inhaler’s usage, such as the date and time a patient takes their medicine, and then wirelessly transmit the information to a central data repository for analysis by GSK’s clinical researchers. The company’s existing sensor is a small device that attaches to the top of an inhaler, and wirelessly connects to a mobile phone app for data download. It can provide insights into adherence patterns, safety, efficacy and economic outcomes. GSK retains an option to negotiate exclusive commercialisation rights to the sensor for use with its marketed portfolio of respiratory medicines administered using the Ellipta inhaler. It comes after recent developments to bring smart technologies and digital monitoring products to the pharma market. In September Otsuka and Proteus Health submitted a joint application for a ‘digital’ Abilify (aripiprazole) pill, which wirelessly transmits data on compliance from a sensor embedded in the tablet to healthcare professionals and carers, to the FDA.